I have a good friend who is very talented and skillful, she enjoys making crochet goodies. 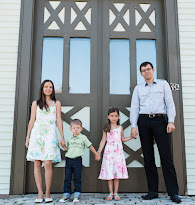 She is a mom to some adorable kids and lives on the west coast. We are actually distant relatives, but we became friends before we became related! When I saw her beautiful creations I thought that all my readers would love this, so I had to share! Another good friend recently had a baby, so Knots by Bellarina sent us some of the knit goodies to try for newborn photography. While the baby refused to be unwrapped, we got some cute photos of the ladybug and turtle newborn photography props. The soft cotton knits are a perfect accessory for a family photo shoot, newborn photos, or just every day. Isn't this totally adorable? 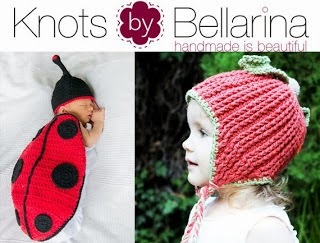 Best thing is, if you have some sort of idea for what you want for your baby or newborn, Knots by Bellarina can bring it to life and make a custom Etsy listing just for you. I don't crochet, I don't think I would have the patience, but I know now where I can go for custom newborn props! As you'll see in the Etsy shop, she also creates really cute MacBook and iPhone sleeves to protect your gadgets. I love this mix of high tech and handmade. I'm sure she can also create custom sleeves for any other gadgets you may have. The prices in the shop are rather reasonable for something that takes that much time to create and your purchase directly supports a family.